BOOK ONLINE CHOOSING YOUR PREFERRED PARTY ROOM TIME, your start time will be 3 hours earlier. PLEASE NOTE THAT THE EARLIEST PARTY ROOM TIME FOR A COMBINATION PARTY IS 12.30 - 1.00PM, WHICH WILL GIVE A 10.00AM START ON THE TRAMPOLINES. Kids will literally jump for joy when you book a party at INFLATABLE ZONE. In addition to the largest Inflatable Theme Park in the UK, your guests will get a reserved table in one of our party areas, and their own awesome dedicated party host to supervise activities and make sure everyone has a great time. It’s a next-level party playground for kids who want to experience a truly radical birthday. Each of your guests will leave with a Inflatable Zone Party Bag, including toy, small sweet cone and a midweek return pass to Boing Zone Trampoline Park. We supply your party food or you can bring your own. KIDS PARTIES HAVE NEVER BEEN THIS AWESOME! You can choose your party extras when you book and ONLY need to pay the deposit for your Party. You will be contacted around 7 days before your party to confirm final numbers and pay the balance. Use your Jump ID from your confirmation email to complete your waiver, each parent has to complete a separate waiver for their own children using the same Jump ID. For Exclusive Use of Inflatable Zone which has 120 capacity please see bottom of page. All these parties are available for adults (Hen/Stag) also at the same price with Dominos Pizza as the food option. There is a fully licensed bar for you to recover in after your bounce. Group Party Photo, which will be uploaded to our Facebook page. 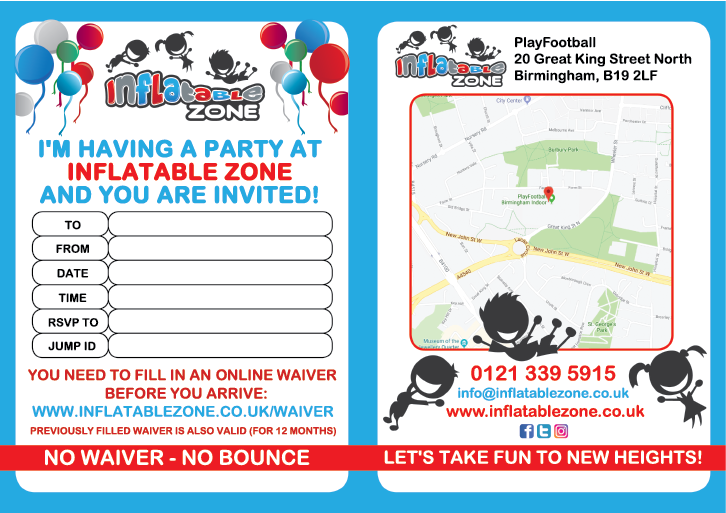 Party bags including toy & sweets & free midweek pass to Boing Zone Trampoline Park. We provide all the party food or you can bring your own. Choose an arrival from a selection of veggie burger, beef burger, hot dog, nuggets, pizza and curly fries. Halal options available. For children aged 4 and under, we provide Toddler Parties just for them. They can use the whole of the inflatable park between 10.00am-11.00am on Saturday or Sunday. For safety reasons each toddler must be accompanied by an indivdual adult, which are included in the party price. Food selection for toddlers: a selection from chicken nuggets, burgers, hot dogs, pizza slices & fries. Kids parties are for age 5 and over, younger siblings are allowed but must be closely supervised at all times by the adult. Toddler parties are for 4s and under, but older siblings are allowed but must stay with the accompanying adult. Waivers must be completed on line prior to arrival, for ALL customers by parents or their legal guardian. OR THEY CAN CELEBRATE BY THEMSELVES IN OUR TODDLER ZONE AT ANY TIME. Minimum 10 people, maximum 19.